This guide walks you through the process of internally connecting two deployments in separate private networks using VPC Network Peering, such that the deployments are able to communicate with each other internally using private IP addresses. For illustrative purposes, this guide will assume that you are trying to connect a Bitnami WordPress deployment with a Bitnami MySQL or Bitnami MySQL with Replication deployment. You have a Google Account and access to the Google Cloud Console. 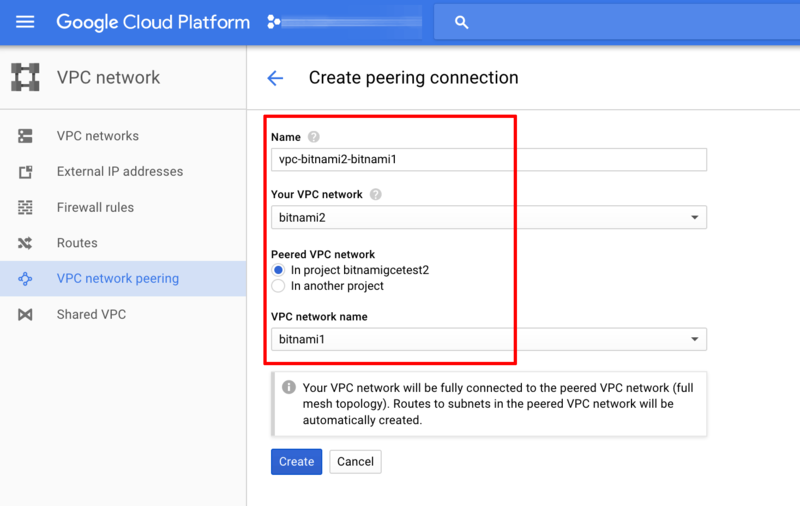 Your Bitnami WordPress and Bitnami MySQL deployments have been launched through the GCP Marketplace, each in a different VPC network and each with one or more private IP addresses. From the left navigation menu, select the “Networking -> VPC network -> VPC network peering” menu item. Read the warning message and click the “Continue” button. Enter a name for the peering connection and select the source and destination networks. Once the networks are connected, the next step is to configure the firewall to enable traffic between them. For security reasons, you should only allow access to specific ports and from trusted source IP addresses. In this example, the firewall should be configured to allow access from the Bitnami WordPress deployment (source) to the MySQL port on the node(s) of the Bitnami MySQL deployment (destination). The steps below should be adjusted depending on the requirements of your application and deployment. 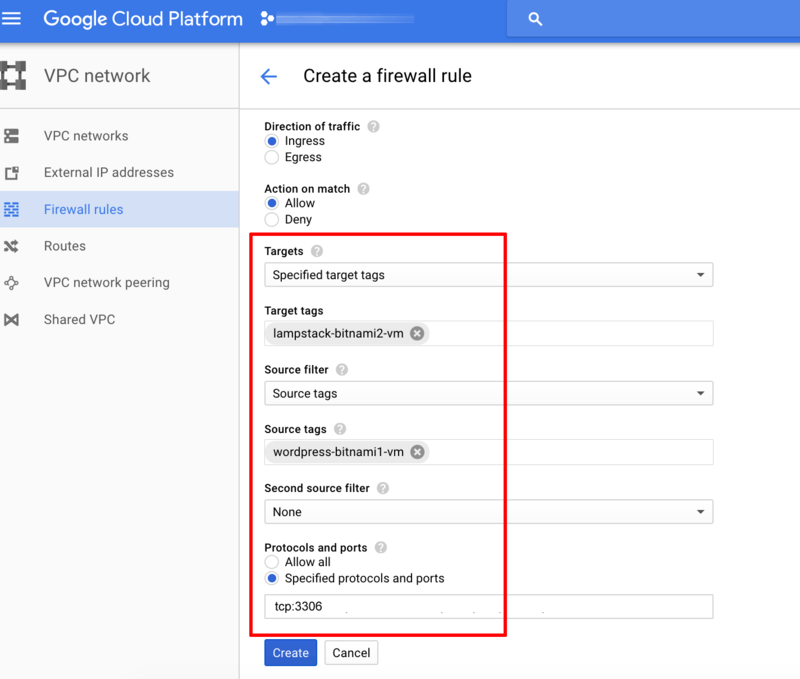 From the left navigation menu of the Google Cloud Console, select the “Networking -> VPC network -> Firewall rules” menu item. Click the “Create firewall rule” button. Network: Select the network hosting the Bitnami MySQL deployment. Direction of traffic: Specify “Ingress”. Action on match: Specify “Allow”. Targets: Select “Specified target tags” or “All instances in the network”. Target tags: If restricting access based on tags, enter the tag for the Bitnami MySQL deployment. If the Bitnami MySQL deployment consists of multiple nodes, enter a tag for each, separated by commas. Source filter: Select “Source tags” or “IP ranges”. Source tags: If restricting access based on tags, enter the tag for the Bitnami WordPress deployment. To allow access from specific IP ranges, enter the private IP address range for the network hosting the Bitnami WordPress deployment. Protocols and ports: Enter “tcp:3306” for the MySQL port. Click “Create” to create and activate the new firewall rule. NOTE: If necessary, follow the steps above to create additional firewall rules for SSH access or access on other ports. The next step is to ensure that the deployments in separate VPC networks are able to communicate with each other. In this example, the easiest way is to attempt to connect to the Bitnami MySQL deployment in one VPC network using the MySQL command-line client from the Bitnami WordPress deployment in the other VPC network. Using the Google Cloud Console, note the private IP address(es) of the node(s) in the Bitnami MySQL deployment and obtain the MySQL access credentials. 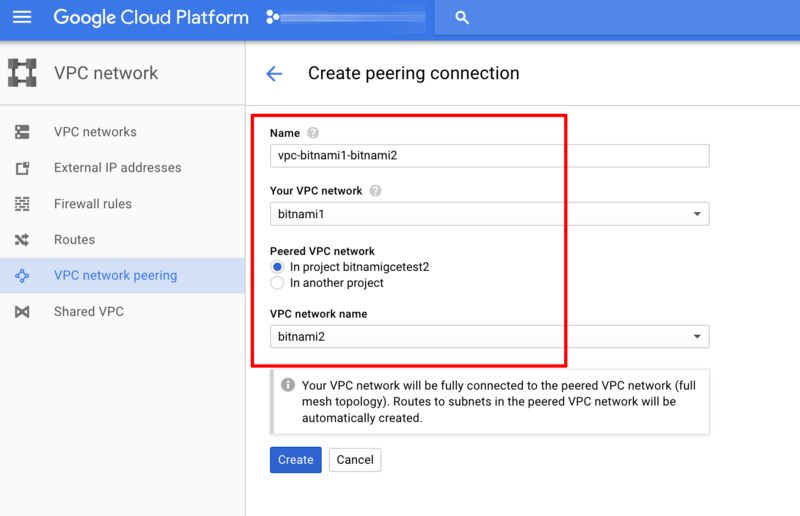 Learn how to obtain application credentials from the Google Cloud Console. Connect to the Bitnami WordPress deployment using SSH. Learn how to connect to the server with an SSH client. From the console, use the MySQL command-line client to connect to the Bitnami MySQL deployment using the command below. Replace IP-ADDRESS with the private IP address of the node you are attempting to connect to. You will be prompted to enter the root user password. If you are unable to connect, refer to the documentation for the target deployment for troubleshooting steps or additional remote connection considerations. Update the Bitnami WordPress configuration in the /opt/bitnami/wordpress/wp-config.php file to reflect the private IP address and credentials for the Bitnami MySQL deployment.